You might as well laugh at yourself, everyone else is. 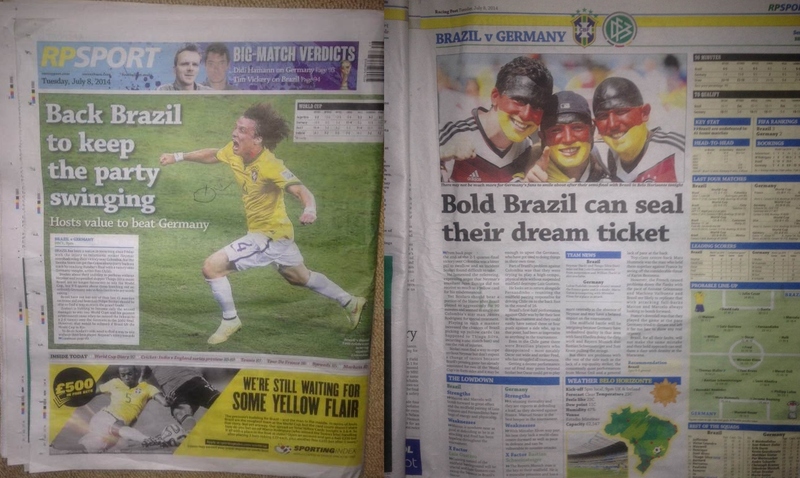 London—After emerging as the only Football Expert to enhance his reputation to legendary status by perfectly predicting the 1-7 scoreline obliteration of the Brazilian team by the German side in the World Cup semi-final match, the Racing Post Football Expert has been lauded by gamblers all over the world as the greatest tipster to ever walk the earth. Thousands of football gamblers all over the world are said to have been quids in after taking the one-million-to-one odds offered on the 1-7 scoreline prediction by bookmakers such as William Hill, Ladbrokes and Coral. At post time, the greatest football Nostradamus in living memory, upon consulting his leather encased crystal ball, had predicted that Argentina will thrash Germany with a 10-5 scoreline in the World Cup final.